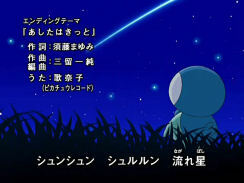 Surely, Tomorrow (あしたはきっと) is the third ending theme to the Pocket Monsters Diamond & Pearl TV series. The song is sung by a woman named Yoshii Kanako (credited simply as "Kanako" for this song) who is currently a member of the talent group Sankei. Her blog can be found here. Used in episodes DP 096 - ?? ?